The EL6631 PROFINET IO controller (master) terminal supports the complete real-time function (RT) as well as extensive diagnostic possibilities. All services in accordance with Conformance Class B are supported. Up to 15 PROFINET IO devices can be projected on the EL6631. The EL6631-0010 PROFINET IO device (slave) terminal enables simple exchange of data between EtherCAT and PROFINET IO. It is a device in the EtherCAT strand, which can consist of up to 65,535 devices. The EL6631-0010 has a 3-port switch. Two ports are fed to the outside on RJ 45 sockets. This allows the I/O stations to be structured as a line topology, as a result of which the wiring is simplified. 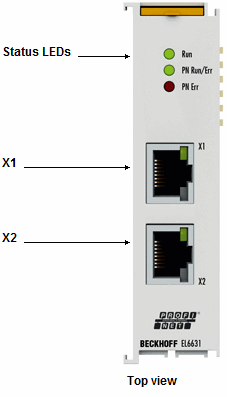 The maximum distance between two devices is 100 m.
Protocols such as LLDP or SNMP can be used for network diagnosis.